Fall 2016: Engineering study, architect fees & demolition expenses, etc. 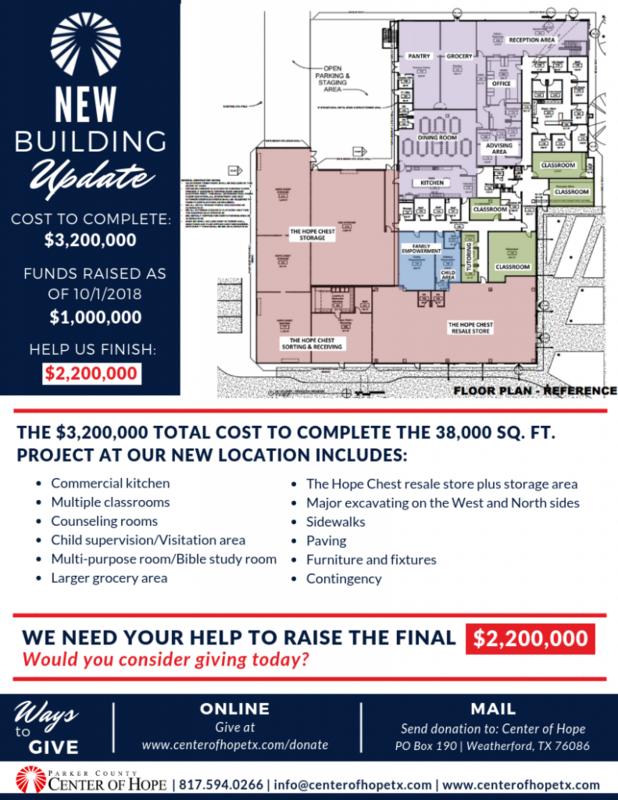 Our plan is to complete the new building project by December 2019. Crisis Assistance Area: Larger advising area with more private meeting rooms; Larger pantry area allows for a “true shopping experience” for our 1,700 participants with over 6,000 shopping visits each year; Larger kitchen area for our 2,000 volunteers who serve each year; Upgrade residential appliances to commercial grade; Enlarged dining room will seat more participants and help serve over 13,000 meals. Family Empowerment: Currently, our Family Empowerment program is held in one room that is primarily used for storage. Additional space will allow us to expand opportunities by providing: children and youth teaching rooms (Study Club and AIM Youth Mentoring Program – a partnership with the Juvenile Probation System); a room for our women’s mentoring group (Refresh Women); private meeting areas for marriage and family counselors; a safe and secure child supervision/visitation area; a learning center for parents; and a library for kids and their families. Job Training Programs: A larger, upgraded space will allow for improvement and expansion of our job training programs: The Hope Chest Internship, Careers Now – Construction Industry and future programs such as Careers Now – Food Service Industry. Education and Career Development Program: Enlarge classrooms to allow 170 student encounters each month to function more effectively as well as offer privacy; Provide additional classrooms to allow for program growth and new learning opportunities; Dedicated computer lab filled with technology to provide over 4,800 classroom hours to students; Increase the number of private meeting rooms for life coaches which provide over 500 appointment hours each year; Additional rooms for one-on-one tutoring. 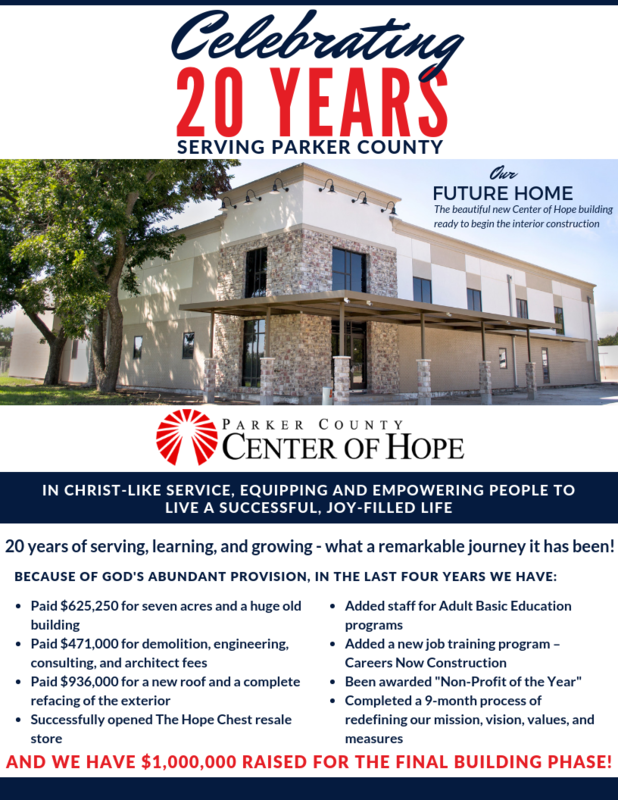 For more information on this project, please contact Paula Robinson at info@centerofhopetxcom.